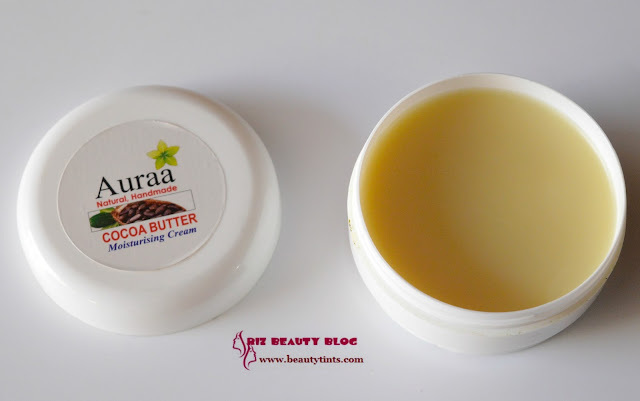 Sriz Beauty Blog: Auraa Natural Handmade Cocoa Butter Moisturizing Cream Review!!! 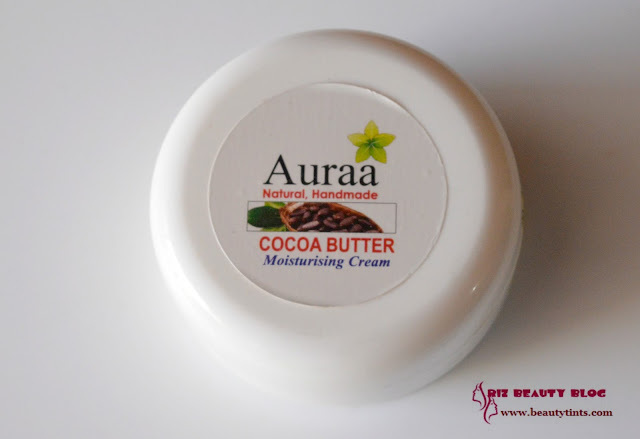 Auraa Natural Handmade Cocoa Butter Moisturizing Cream Review!!! 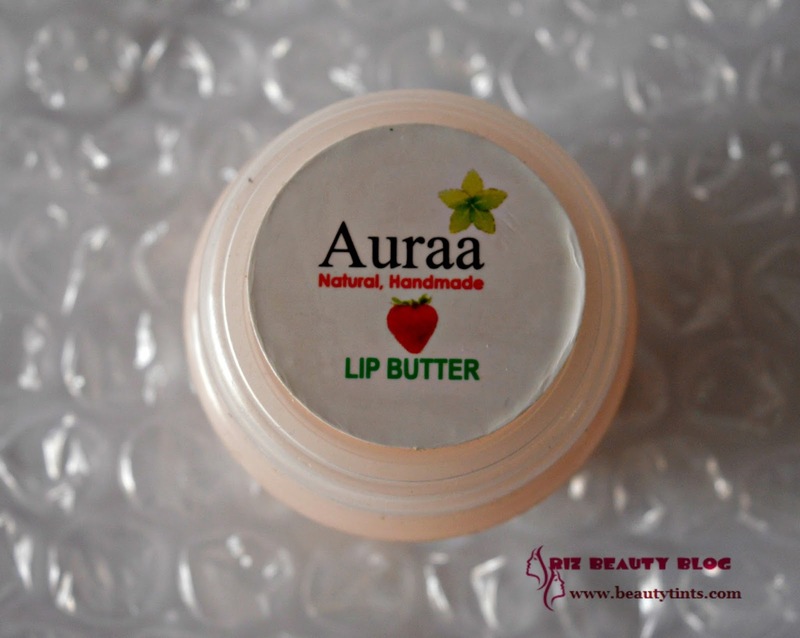 Recently I have reviewed the Strawberry Lip balm from Auraa, which is my first product from the brand and today I am reviewing one more product which is their Natural Handmade Cocoa Butter Moisturizing Cream. 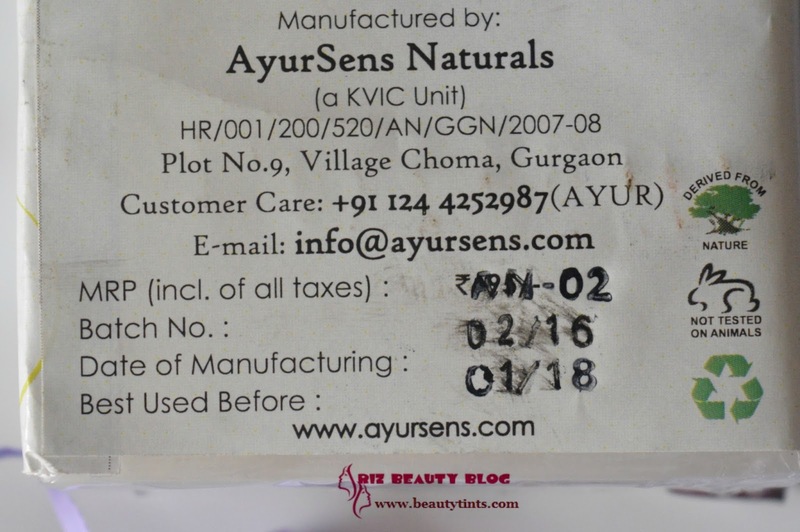 Packaging : It comes in a simple plastic tub packaging with labels about the details of the balm. 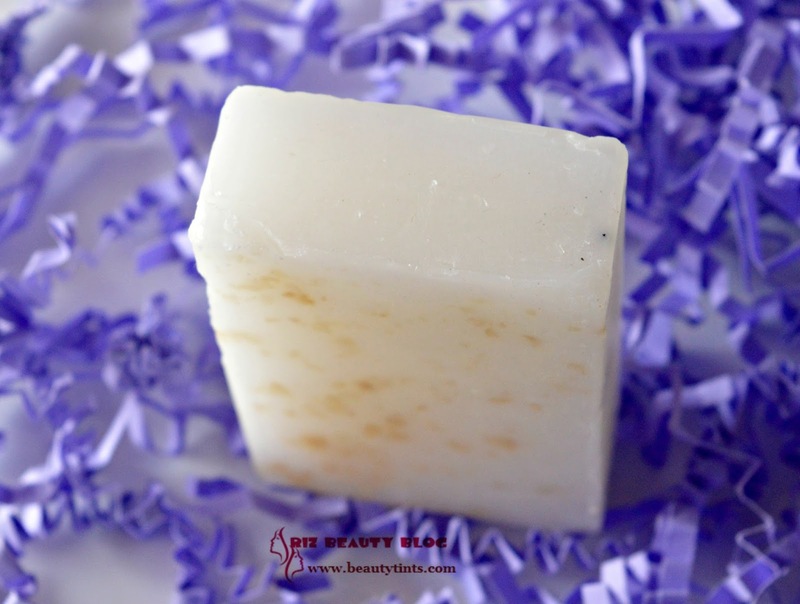 Color and Texture : This looks off white in tub but it is a transparent cream! 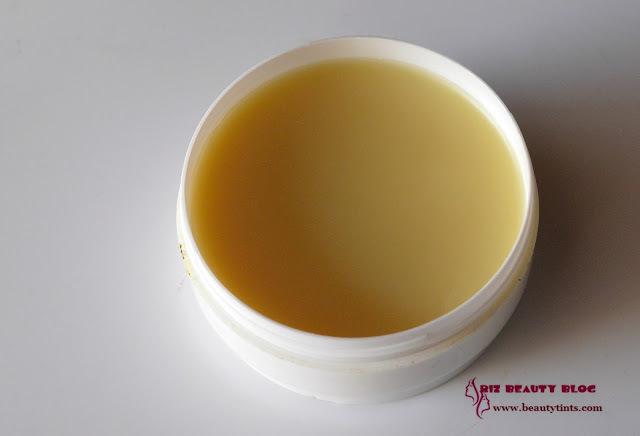 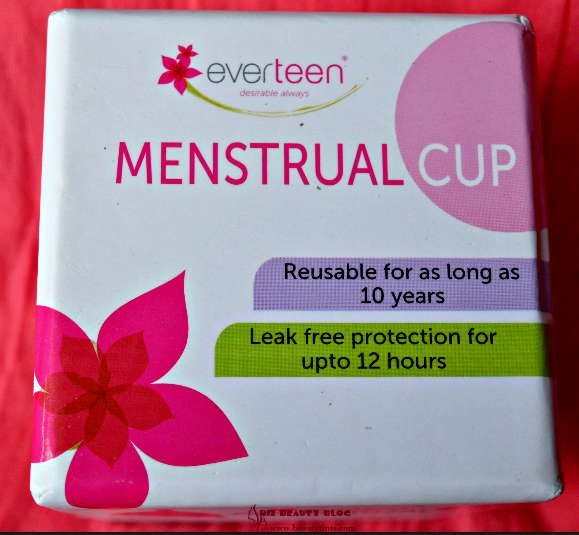 Ingredients : Cocoa butter,Beeswax,olive oil,coconut oil,vitamin E,Essential oils. 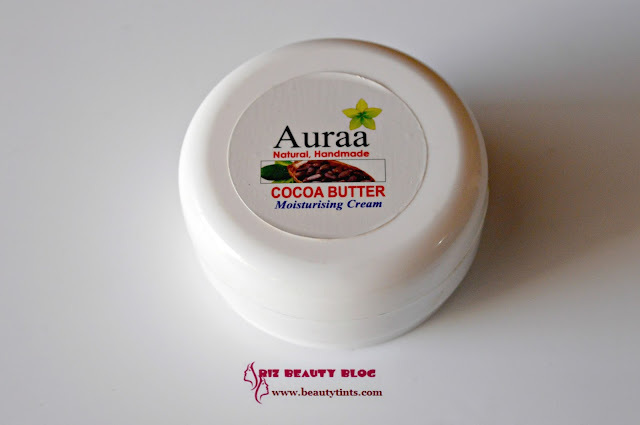 My View On the Product : This Auraa Natural Handmade Cocoa Butter Moisturizing Cream is a like a solid cream and I just rub my palm over it and apply it to my skin .It is very light in texture and gets absorbed into the skin easily.It comes in a little tub packaging with a screw cap.It hydrates the skin very well for super long time and there is no need of reapplication in a day!Though it looks like a solid heavy cream,the consistency is light and non greasy and so it can be used in any season.It has a very mild fragrance.The ingredient list is very impressive with natural and organic ingredients like Cocoa butter,Bees wax,olive oil,coconut oil,Vitamin E and essential oils.Though it contains bees wax,it doesn't form a heavy layer on the skin instead it absorbs quickly into the skin with out leaving any residue behind.It is free from harmful ingredients like parabens and other preservatives.It is against animal testing.A little goes a long way and it is cheap compared many other moisturizing creams in the market.The only issue with this is its limited availability.The tub packaging is a bit unhygienic to use but for a cream with this kind of consistency only tub packaging works and so no issues with it for this. Final Conclusion about Auraa Natural Handmade Cocoa Butter Moisturizing Cream : Those who are looking for an all natural yet affordable moisturizing cream that hydrates the skin well should definitely check this out!